It's the final trading day of May. 1. Don't sell in May: Anyone following the market mantra "Sell in May and go away" would have missed out on some decent gains this month. The Dow Jones industrial average and S&P 500 are both up by about 1.6%, and the Nasdaq has surged by 3.2%. But it doesn't look like the indexes will hold onto all those gains on the final trading day of the month. 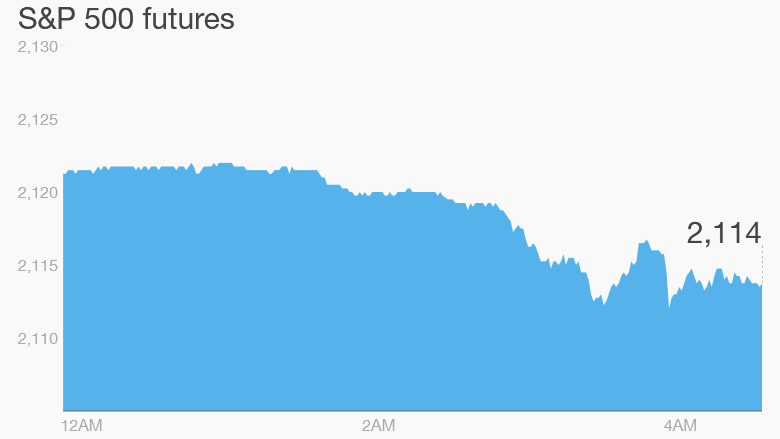 U.S. stock futures are edging down ahead of the open. 2. International markets overview: European markets are all declining in early trading, with renewed nervousness about the fate of Greece setting the tone. A German newspaper quoted the head of the International Monetary Fund as saying that it was possible Greece would have to leave the eurozone. In Germany, the benchmark Dax index is declining by about 1%. Asian markets ended with mixed results. The mood in China has calmed down after a large pullback Thursday, following stellar gains so far this year. Hyde Chen, an equity analyst at UBS Wealth Management, said profit taking, as well as investors holding back ahead of a rush of IPOs next week, had contributed to the volatility. 3. Stock market mover -- Altera: Shares in Altera (ALTR) are surging by about 10% premarket based on a New York Post report that says Intel (INTC) is considering a $15 billion bid for the smaller chipmaker. 4. GDP galore: The U.S. Bureau of Economic Analysis will release a new estimate for first quarter GDP at 8:30 a.m. ET. The original estimate showed the U.S. economy grew by just 0.2% in the first three months of the year, which was well below expectations. Many now predict the economy may have actually shrunk in the first quarter. Friday also saw disappointing GDP readings from Switzerland and Sweden. The Swiss economy contracted by 0.2% in the first quarter after a sharp appreciation in the currency slammed exports. Many economists are also expecting a negative reading for Brazil's GDP, which is set for release Friday. 5. Earnings and economics: Big Lots (BIG) is reporting ahead of the open. The University of Michigan will update its monthly consumer sentiment index at 10 a.m. ET.